"Candidates must show that they are neither alcoholics nor drug addicts." Election frontrunner, comedian Volodymyr Zelenskyy has challenged his competitor, incumbent President Petro Poroshenko to a public debate ahead of the runoff. 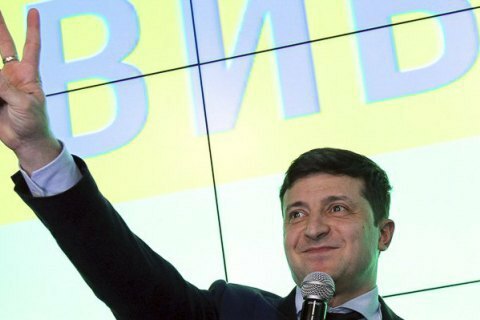 Zelenskyy's team published his video address on Facebook. "I am addressing Petro Poroshenko, you invited me to debate, dreaming that I would run away, ignore or hide… No, I am not what you used to be in 2014. Challenge accepted," Zelenskyy said. He also put some conditions: the debate must be held on the Olympic stadium in Kyiv; all TV channels can broadcast it live; the debate is open to all journalists. Also, he demanded that Poroshenko publicly state that he will be debating "not with a redneck, not with [media tycoon Ihor] Kolomoyskyy's puppet, but with presidential candidate Volodymyr Zelenskyy". "The candidates must undergo medical examination to show that they are neither alcoholics nor drug addicts… The country needs a healthy president," he added. Zelenskyy is expecting Poroshenko's answer within 24 hours. Ahead of the first round, Zelenskyy, Poroshenko and Yuliya Tymoshenko refused to hold debates. On 20 March, first deputy speaker Iryna Herashchenko registered a bill making it mandatory for contenders in the presidential election runoff to hold public debates. Following the first round of the regular presidential election held on 31 March, Volodymyr Zelenskyy is in the lead with over 30% of votes while Petro Poroshenko has a little less than 16%.